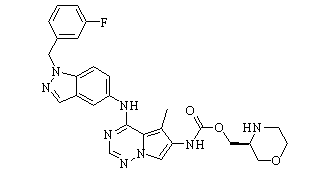 AZD-8931 is a reversible, ATP competitive EGFR inhibitor of with IC50s of 4, 3 and 4 nM for EGFR, ErbB2 and ErbB3 in cells, respectively. 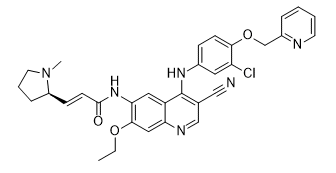 AV-412 (MP412) is an EGFR inhibitor with IC50s of 0.75, 0.5, 0.79, 2.3, 19 nM for EGFR, EGFRL858R, EGFRT790M, EGFRL858R/T790M and ErbB2, respectively. 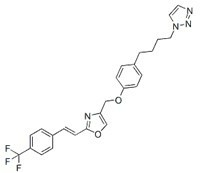 Pyrotinib (SHR-1258) is a potent and selective EGFR/HER2 dual inhibitor with IC50s of 13 and 38 nM, respectively. Pyrotinib also known as SHR-1258, is an orally bioavailable, dual kinase inhibitor of the epidermal growth factor receptor (EGFR or HER-1) and the human epidermal growth factor receptor 2 (ErbB2 or HER-2), with potential antineoplastic activity. Epertinib is a potent, oral, reversible, and selective tyrosine kinase inhibitor of EGFR, HER2 and HER4, with IC50s of 1.48 nM, 7.15 nM and 2.49 nM, respectively; Epertinib shows potent antitumor activity. Tyrphostin AG 879 is a protein tyrosine kinase inhibitor with potent effects on TrkA. 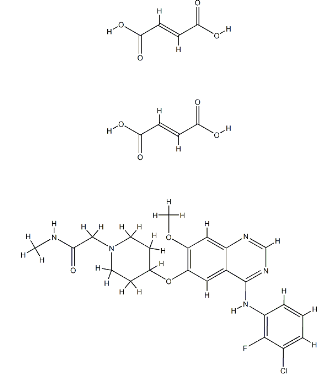 BMS-599626 (AC480) is a highly selective pan-HERKinase inhibitor with IC50 of 20 and 30 nM for the inhibition of HER1and HER2, respectively. AC480 (BMS-599626) is a selective and efficacious inhibitor of HER1 and HER2 with IC50 of 20 nM and 30 nM, ~8-fold less potent to HER4, >100-fold to VEGFR2, c-Kit, Lck, MET etc. Mubritinib (TAK-165) is a potent inhibitor of HER2/ErbB2 with IC50 of 6 nM; no activity to EGFR, FGFR, PDGFR, JAK1, Src and Blk. CUDC-101 is a potent multitargeted HDAC, EGFR and HER2 inhibitor with IC50 of 4.4, 2.4, and 15.7 nM, respectively.